In a continuation of the theater of the absurd, all 100 U.S. senators were driven to the White House to listen to a top-secret intelligence briefing on North Korea. North Korea now has missiles capable of reaching Hawaii and will soon be able to extend its reach to California. As they also have nuclear weapons, putting two and two together should not be difficult, but we are told it will take time to reduce their size to fit missiles. Yet India and Pakistan did it years ago — the latter also has the even smaller tactical battlefield warheads. It is inconceivable the North Koreans did not work on such practicalities simultaneously. The crucial element has always been producing the fissionable material. As always the illogical logic of propaganda aimed at the American people prevails: first the scare of a ‘mad’ Kim Jong-un coming at them with missiles and then the ‘but’ of a window of opportunity for military action before doom. It is all a reminder of ‘the smoking gun being a mushroom cloud’ before the catastrophe of the Iraq war. So is it all bluff directed at North Koreans for the South Koreans will never accept the military option? They have also been embroiled in a leadership crisis following a political scandal, culminating in first the impeachment of President Park Geun-hye and then her removal from office on March 10, 2017. A fresh election is scheduled for May 9. To the extent our mainstream press has become an unquestioning cheerleader for conflict, one cannot expect any restraining influence. Its shocking behavior in the recent Syrian sarin gas attack is illustrative. The narrative of Assad the enemy holds that any abominable incident is automatically ascribed to him — no questions asked. Within hours of the attack everyone was blaming Assad. Cui bono? Who stands to gain was never an issue; neither was waiting for any kind of investigation. No one questioned why … why would he do this when he is not short of conventional bombs? Critical thinking from the American public is almost impossible when half do not know where Syria is. Gary Johnson, the Libertarian Party candidate for President in the last election, had an embarrassing moment last September when asked about Aleppo. His response: “And what is Aleppo?” That was indeed revelatory for Gary Johnson is a noted politician, and was the governor of New Mexico from 1995-2003. Like the president he too is a businessman and author. It all shows that when you live in the most powerful country on earth little countries are off the radar, forgotten in the midst of domestic (often) pocketbook issues. It is purportedly the job of the news media to educate the public, a job at which they have clearly failed. Meanwhile, North Korea staged one of the largest live fire artillery drills to mark its military founding day, as a U.S. missile submarine docked in the South. The point clearly to drill home Seoul’s vulnerability. Pressure is being put on China to bring the North to heel by, say, using an oil embargo as a tool. Yet China, which is urging restraint by all sides, is unhappy with the Terminal High Altitude Area Defense (THAAD) system being installed in South Korea. 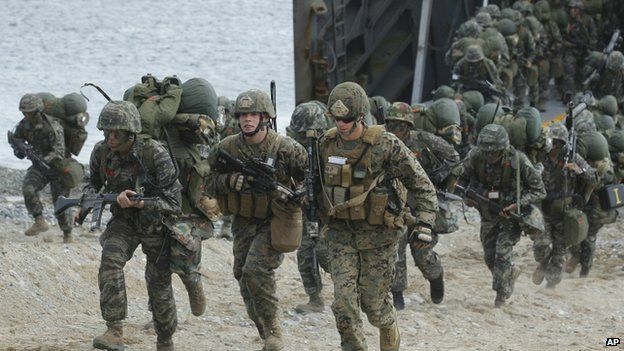 It’s Defense Ministry also announced live fire drills and new weapons tests in response, and complained the system ‘damages the regional strategic balance and stability.’ Angering China to secure help against North Korea defies logic. Stirring the pot further is Moon Jae-in, the South Korean opposition leader now ahead in the polls for the May 9th election. He has vowed to review the U.S. agreement with South Korea allowing the THAAD installation. In the meantime, villagers around the site continue their protests. So, is the U.S. about to go to full-scale war with North Korea? Not in a month of Sundays! Both US and North Korea have to exercise restraint in the larger interest of people of not just Koreans but also people of the world at large because the war affects whole world directly or indirectly. For a peaceful world, conditions of war must be diffused as both sides have modern equipment of warfare. Nuclear weapons destroy each others lands and people will have to bear repercussions for generations to come.